Why Don’t Girls Play Air Guitar? Is it genetic or environmental? As teenage boys, we had posters of the “rock gods” captured in poses during concert performances. They looked so cool, with the lights and the costume and the promise of women. When any one of the songs came on we had to assume the position. Now that might just be where the difference lies, seeing as our right hand was strumming and picking along at our crotch. The male is much more interested in getting near his “area” than the female is during the pubescent years. Although every young (and old) girl does seem to be interested in that area once the male has established himself in that particular discipline. So maybe it comes back to the reason men do everything-we want girls to touch us down there and this was just our subliminal way of showing it. But it is a rather instantaneous reaction. At any age, if the right tune comes on we boys are inclined to “play along” and it doesn’t matter who’s watching. I recently watched a musical performance on Saturday Night Live and wondered what do the boys of today, with a mostly hip hop and rap dominance, do to imitate the musicians they love-there aren’t many guitars. Do they pretend to be programming computers to rip off a riff from a previous artist? From what I’ve seen, I guess it’s just enough to wear gold chains and yell along with the words. Man their dads must go nuts, mine just told us to wear headphones. *The picture included features Lola, so maybe my theory is completely invalid. I haven’t had a date for some time now. It seems the rest of my body is doing its best to cooperate, responding to the exercise and healthy eating I’ve been giving it, feeling good. 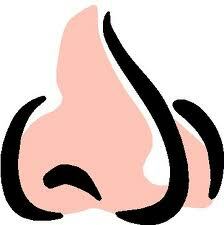 But my nose seems to have something against me. How many times has it done this to me without my knowledge. Now I have hedge, I mean nose trimmers. I am cursed by some Italian thing or something whereby there ain’t nothing on top but it sprouts out of my ears and nose with the utmost speed. I can usually catch it. But then there’s morning like this one, when I shower then finish shaving in the mirror and BANG there it is, this long black tentacle looking thing crawling down from my nostril presumably to shake hands with my mustache. How many times has that happened when I’ve been talking to a girl? Does the little sucker snake out and hiss? I didn’t think there were that many lesbians. What did I do to it? Smell the wrong flower? Squeeze too hard with a tissue? Bury it in the wrong woman? Come on fellas, give a guy a break. Women smell nice. I promise to give you a woman with great hair to snuggle into, a natural scented beauty to graze along her shoulder. And I promise to check her feet, cause we know we’ve got something to be attentive to there as well. But you help me and I help you. We can do this, together!